To make way for my brand new, all-electric Chevrolet Bolt EV, I’m sending my old reliable standby car to the crusher as part of California’s Vehicle Buy Back Program. Yes, my 1993 Plymouth Voyager is not long for this world. I’m not really sad about it, but I do feel a little twinge of nostalgia. My older son drove this car in college, and it was his mom’s and stepdad’s family car before that. I have all the records to prove it was purchased brand new with 43 miles on it on April 30, 1993. They took good care of it so I could neglect it and it would still run fine in 2017. 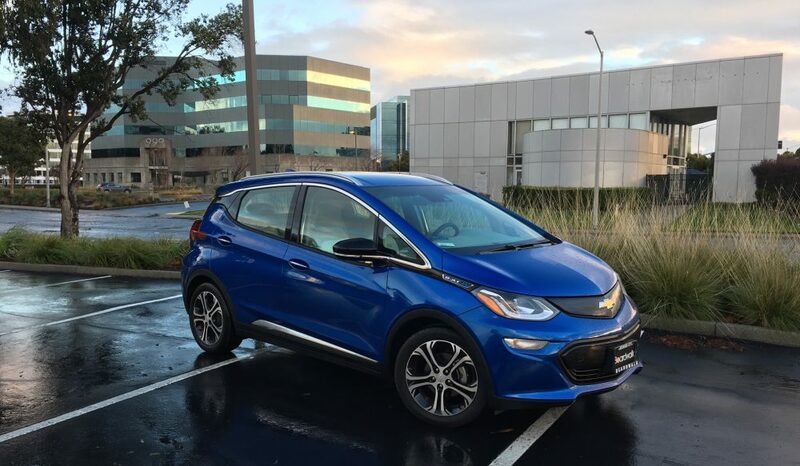 Of course, the Bolt EV is a great upgrade for me–tomorrow’s technology in place of yesterday’s, with all of the latest safety, entertainment, convenience and planet-preserving features. I’ll be cruising in the 2017 Motor Trend Car of the Year–the 2017 Green Car of the Year, and likely the North American Car of the Year (we’ll find out in the next few days). But this dirt cheap old van doesn’t really deserve to die. As long as I drive it once in a while to keep the battery charged, put in a few gallons of gas and add air to the tires, it’s a fine fill-in car for when my upright bass won’t fit in the test Mazda Miata. It was invaluable the time I needed to haul a 4 x 4-foot oil painting from the gallery to my living room. Registration is about as cheap as it gets and insurance costs are negligible. As someone who’s always testing a new car, for me to drive around in a 23-year-0ld minivan with a rusted roof and hood and visible spiderwebs on the mirror supports is a different experience. Nobody smiles at you at the traffic light. I feel like Jed Clampett on the Beverly Hillbillies. But despite its neglected exterior, the metallic blue van, with only 92,000 miles on it, is actually pretty pleasant inside. Sure there are some stains on the rugs, but the tall, chairlike front buckets are very comfortable in blue plush cloth. The look is 1990s utilitarian, but it seems appropriate here. The bulky pull-out cupholders, the temperature sliders on the climate system, the tiny buttons on the aftermarket FM radio. And there’s room for seven people! The 3.3-liter V6 under the hood of this Sport model hums contentedly when you press the accelerator–it doesn’t buzz like a four-cylinder. The low window line, compared to today’s tall crossovers, provides a panoramic view of traffic around you. As an SE model, my Voyager has a leather steering wheel – and check out that classic set of full gauges (working oil pressure and battery charge meters on top)! Airbags were still in their early stages, so the pads are big, too. Like those little horn buttons in thumb position? My Sport Wagon shows off its subtly styled alloy wheels and high-profile tires (yeah, the rims aren’t big or fancy, but they ain’t hubcaps, either). I took my van out for a few errands today. It zipped along just like usual. You can’t see the rust from this angle. The paint on the vertical surfaces is actually pretty decent. Colorful bumper stickers date from my son’s college days. I’ve enjoyed retaining them on my car. This is a second-generation Chrysler Corporation minivan, an enhanced version of the original ’84 model. Chrysler invented the minivan in the early 1980s and dominated the field for years. Now, Toyota and Honda do. But, of course, today is also the era of the crossover SUV, so minivans are less hip, anyway. Although, as it turns out, the next “cool” minivan is the Chrysler Pacifica Hybrid–my car’s descendant–which is the first of its kind. But it’s time to move on. Sacrificing our funky, high-polluting old cars is what we need to do en masse to cut CO2 to moderate the effects of climate change. I know that sacrificing an old gas burner for an EV will make a very tiny impact, but we need to do it everywhere. And we need to have clean power plants, too. And we need to share rides. And we need to do a lot of other things. But now, it’s time to say goodbye to an old friend, and welcome a new one. This entry was posted in cars, climate change, hybrid cars, hybrids, retire old cars, Uncategorized, Vehicle buy back program and tagged carbon footprint, cars, climate change, global warming by stevegoesgreen. Bookmark the permalink.